JOSH TRENTADUE (b. 1994) is a composer, performer, arranger, transcriber, and musician at heart. Born and raised in Lansing, Michigan, he began to study piano and percussion performance at an early age. During his high school years in the town of Grand Ledge, as a member of their Wind Symphony, he became inspired by various composers and works (notably for wind ensemble) that further encouraged him to pursue a career in music. During these years, he performed multiple times at the Michigan Music Conference under different All-State ensembles formed by the Michigan School Band and Orchestra Association. He also appeared with the Spartan Youth Wind Symphony in its first year and has subsequently performed with them multiple times. Other locations he has made appearances at include Walt Disney World and the historic Carnegie Hall. 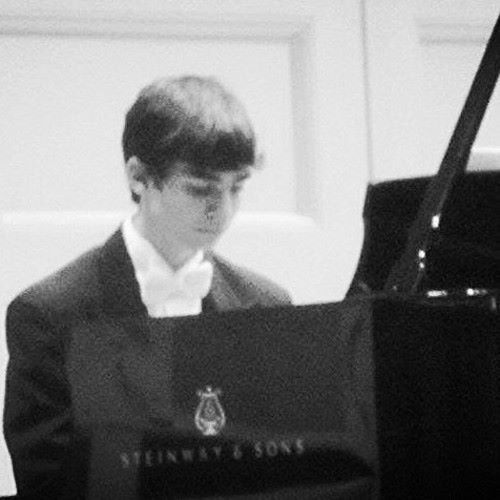 Trentadue is currently pursuing a Bachelor of Arts degree in Music Composition at Michigan State University. He has performed with numerous acclaimed ensembles within the college, including the Wind Symphony, Symphony Orchestra, and Symphony Band. Trentadue studied composition under Jere Hutcheson for several years until Hutcheson’s retirement in 2016, and he now currently studies with David Biedenbender. He has also studied percussion performance under Jon Weber, the current director of the Spartan Marching Band Drumline. Trentadue is a large supporter of new music and strives as a composer to bring the best possible experience to his audiences. His own compositions have been premiered across the midwest regions of the United States as well as the 2015 North American Saxophone Alliance convention in Illinois. He was a selected winner of the 2015 MSU Large Ensemble Competition and composed his first work for wind ensemble Celestial Voyage for the college’s Campus Band. In addition, Trentadue has also composed for electronic media, including his debut album Neon Revolution, as well as music for several short films. Trentadue’s style is influenced by rock-and-roll, jazz, heavy metal, film score, and classical music. His inspirations are eclectic and range everywhere from composers such as Pyotr Ilyich Tchaikovsky, Leonard Bernstein, and Dmitri Shostakovich; to film composers such as John Williams, Alexandre Desplat, and Michael Giacchino; and to bands such as Rush, Queen, The Beatles, and Dream Theater. In his spare time, Trentadue is an avid film buff and enjoys writing critical reviews as well as embarking in photography. He is a member of both ASCAP (the American Society of Composers and Publishers) and PAS (the Percussive Arts Society), and is self-published under M.O.T.I.F. – Music of the Introspective Fields.